Today I am thankful for sorbet. As the summer heat steadily approaches (though my hope is that it will hold off for as long as possible), I find my taste buds longing for sorbet. By now you all know that I enjoy ice cream, frozen yogurt, and frozen custard. But did you also know that my appreciation for frozen and refreshing treats extends beyond the world of cream, milk, and eggs? Though those items come together to form the base of some of my favorite treats, sometimes I prefer treats that are on the lighter side of the calorie spectrum, and that’s where sorbet comes in. 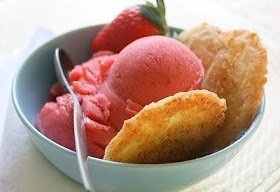 Sorbet is smooth, fruity, airy, sweet (but not overly so), easy to make, and healthier than many of its frozen counterparts. I thoroughly enjoy traditional flavors like strawberry and pineapple, however, I have recently come across a mango sorbet recipe that I am looking forward to trying. If you are curious about it and think that you might be interested in hearing more about it, leave a comment letting me know and I will post a link to the recipe.